This page displays an up-to-date listing of what's new in the computer industry for products and services including updates and fixes that can help all users. LCD monitors, flat, space-saving computer displays are the way to go and they are very reasonably priced right now. Look for a nice suite of features on the monitor, including a quality OSD that allows a user to control many different aspects of the monitor's operation, like refresh rate and screen size and position. Look for a high field of vision. One should be able to read the display even if one is not seated directly in front of the screen. Look for dead pixels, small black points on the monitor that do not display any color when the monitor is turned on and connected to a computer. Most monitors have a few of these, but one should not by a monitor that has clusters of dead pixels. Look for a three-year warranty and quality, free technical support. Monitors that Interrealm has selected for inclusion with new systems are checked for quality and for adherence to the requirements in the list above. Simultaneously lift and tilt two LCD displays with just a touch for maximum ergonomic comfort. 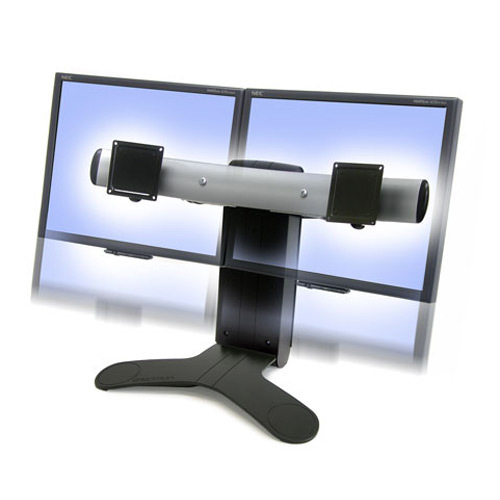 This stand expands your computer desktop across two screens, ensuring the utmost accuracy and productivity in any work environment. View the lastest operating system features from Microsoft. We all want less wires! Cable is probably ranked first, according to Interrealm, among the broadband options when one considers ease of use and speed. It is theoretically the fastest of these choices, with theoretical speeds up to 27 Gbps and practical speeds between 500 Kbps and 1 Mbps, twice to five times as fast as basic DSL. Availability and price make cable an excellent option as well: 46% or so of U.S. homes can access a cable service, and it costs from $35-$50 per month, after installation fees. The only major downside of cable is that if one lives in an area where many people have cable internet access, speeds slow down; however, a new set of specifications that would limit the effects of sharing cable internet access in this manner, DOCSIS 1.1, is currently being developed. DSL is a close second to cable internet access. It is not quite as fast as cable, ranging from 256 Kbps to 1.5 Mbps, and costs a little more, especially since the price for monthly service went up after the economic slowdown. The service is often a nightmare to set up; cable is far easier. DSL companies now charge around $50 for a month of service, but they also charge between $100 and $300 for a DSL modem and sometimes they even charge up to $200 for activation. Only about a third of U.S. homes have access to this service, so availability is not as high as that of cable. The only distinct advantages of DSL are the fact that users do not have to share their bandwidth with anyone else, and the fact that DSL provides a phone line, even when one is online. DSL is also less susceptible to radio frequency interference from other devices than cable. Fixed Wireless has some severe limits, but its speed places it among the top three for our ranking. To use fixed wireless, a modem and a transceiver are hooked up to your computer; these communicate with a tower that can be up to 35 miles away, and that provides internet access. Fixed wireless is fairly pricey, as the modem and transceiver cost up to $300, but the service is the same price as DSL: about $50 per month. Speed of fixed wireless is on par with cable, at 1 or 2 Mbps on average, but both methods of broadband access have the same limitation where speed is concerned: bandwidth is shared with other users in one's neighborhood. The major limitation to fixed wireless is the line of sight requirement between transceiver and tower: if a big building or tree is in between the two units, internet access will not be available. Storms and other weather conditions also limit availability. Satellite is the least desirable of the broadband options, due to speed, installation, cost, and interference. The major advantage of satellite, which links to the internet via a satellite dish, is that it can be used to access the internet almost anywhere. However, it is only as fast as basic DSL, up to about 500 Kbps for downloads. Other problems include price: $700 for equipment and installation, and $70 per month for access; and the fact that you have to share your bandwidth with other users. Weather interference is also a big problem with satellite access. The two major satellite companies available, StarBand and DirecWay/HughsNET, also reduce your bandwidth if you use a lot. Satellite access should only be considered if one lives in an area that does not have DSL, cable, or fixed wireless access, and then only if money is not an issue.